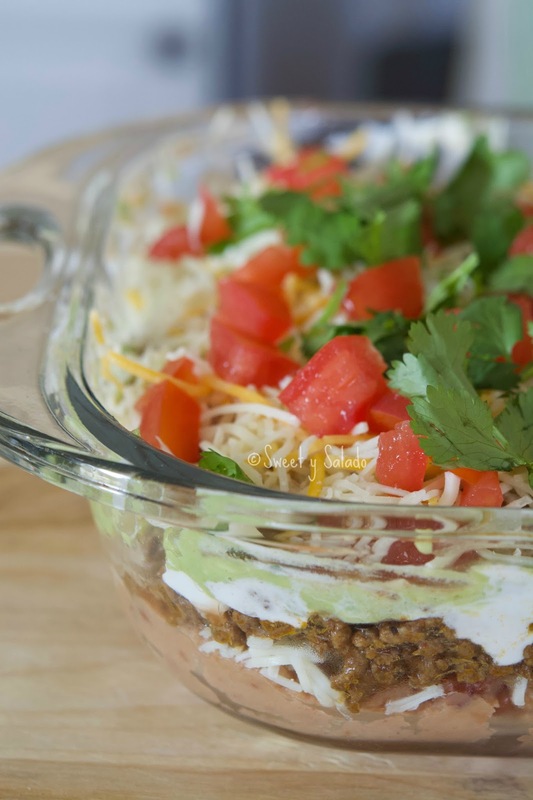 If you’re looking for an easy recipe to serve on game day, a family gathering or as a delicious weekend snack, then you need to start making a seven layer taco dip. And I’ll tell you why. First of all, there is very minimal effort because the only thing you really need to cook is the beef, unless you want to make the refried beans, guacamole and salsa from scratch. Everybody loves the flavor because… who doesn’t love a good taco? You can also feed a nice group of people with just one baking dish. On top of that you can serve it with your favorite tortilla chips and the beer or drinks of your choice. What could be better than that? To make the taco ground beef you can use either the store bought taco seasoning or make your own with this recipe. I always use that recipe mainly because the pre-made ones usually have a large amount of salt and that just ruins the whole meal for me. But, you do have to add either cornstarch or flour to the beef to help the taco seasoning thicken which is no problem at all. 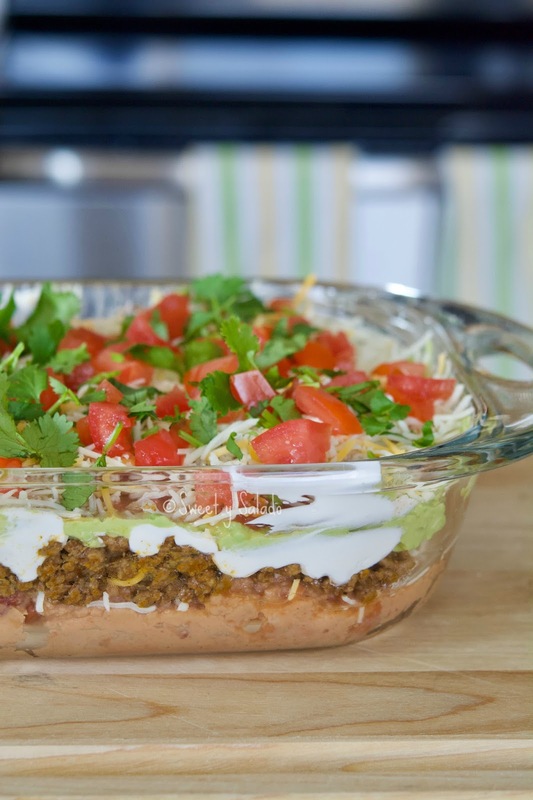 Another thing, it is called seven layer taco dip because you end up adding about seven layers of ingredients, if you count the two layers of cheese. But that doesn’t mean that you can make less or more layers. Not only that, feel free to change the type of ingredients that you use and even the order you want to layer them. Love black olives, green onions and jalapeños? Add them! Hate cheese and refried beans? Don’t add them. See, how easy it is? In a large pan cook the ground beef over medium high heat until it is completely cooked. Drain the fat and add the water, taco seasoning and cornstarch. Mix well, reduce heat and simmer for 3-4 minutes or until the sauce thickens. Remove pan from the heat and let the brown beef cool completely. 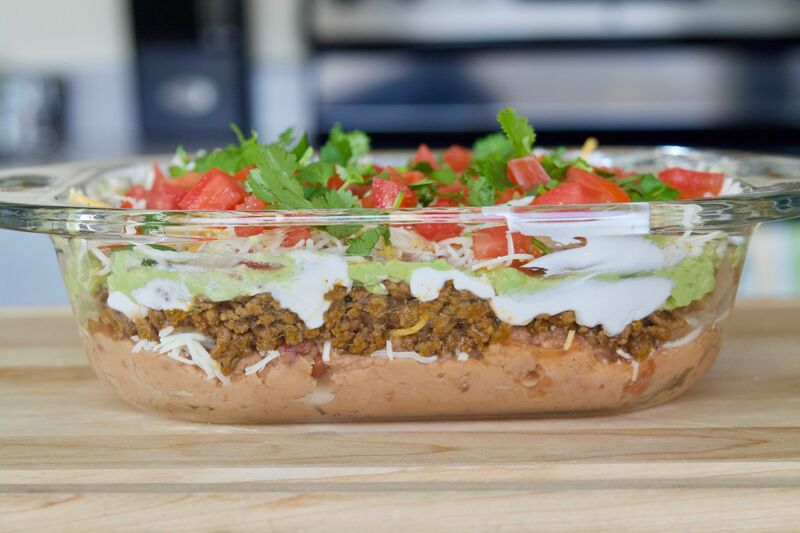 In a 8x8 inch (20x20 cm) baking dish spread a thick layer of refried beans. I usually like it to be about ½ inch (1,25 cm) thick. Add half the amount of cheese as your second layer. Place the beef on top of the cheese. Spread the sour cream on top of the beef. Spread the guacamole on top of the sour cream. Add the salsa on top of the guacamole. Add the last amount of cheese on top of the salsa. Finish the last layer with the chopped tomatoes and cilantro. This dish is best when served at room temperature but you can also cover it with plastic wrap and refrigerate it until it is time to serve. 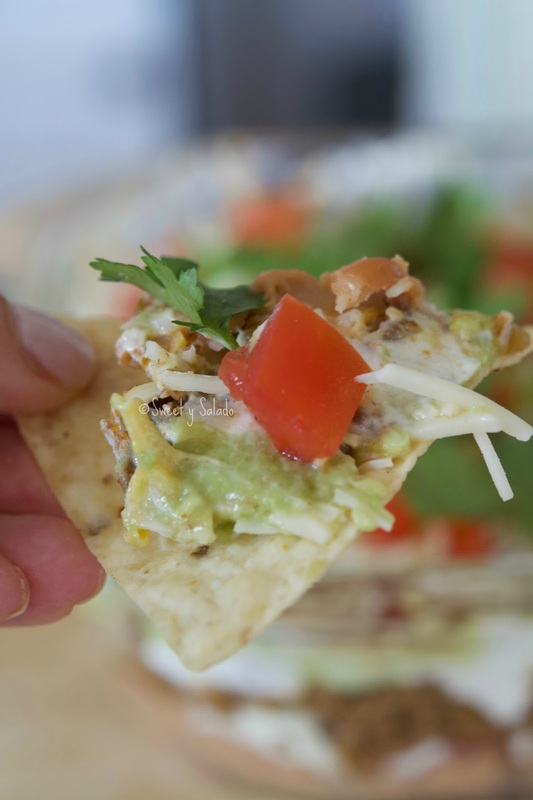 It can be served with your favorite tortilla chips and/or veggies.